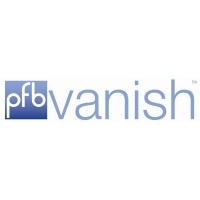 PFB Vanish is fantastic for both men and women! In order to treat ingrown hairs and skin irritation effectively, a solution must be able to penetrate the barrier properties of skin. 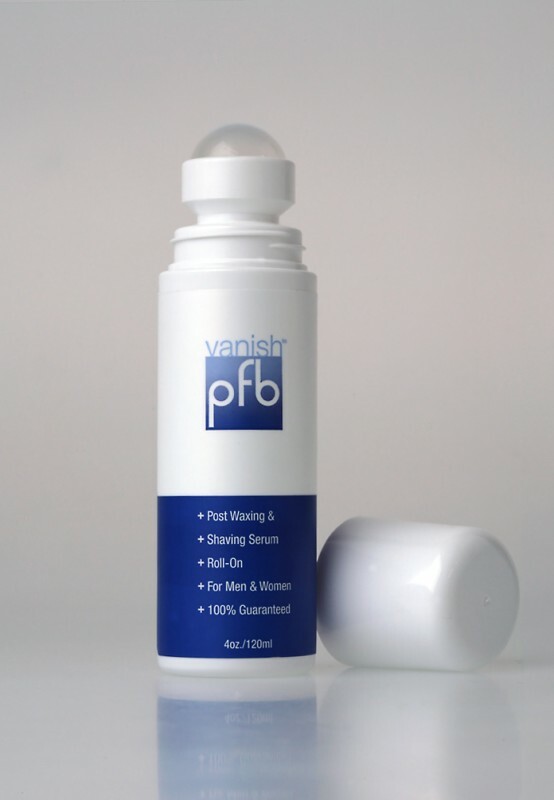 PFB Vanish contains exfoliating and moisturizing ingredients to enhance penetration for a quick response and maximize the results. 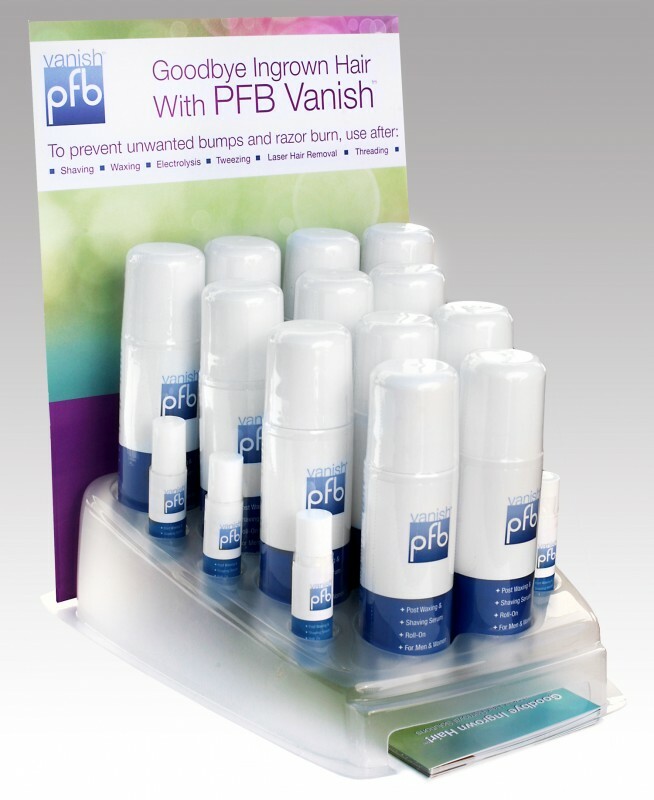 PFB Vanish works by quickly reducing inflammation with its antiseptic and anti-inflammatory actions. Then, by gently exfoliating dead skin cells, leaving hair follicles and pores clear, allowing hairs to grow out normally. Not all women and men can look clean-shaven. Some individuals – especially with heavy, curly hairs may develop ingrown hairs. Shaving facilitates the process of ingrown hairs by “sharpening” the free hair end. Tender pimples then arise when closely cut hairs grow out and pierce the hair follicle or curl back and re-enter the skin to cause a foreign body reaction. more common with curly hair. To help relieve this condition, roll on PFB VANISH to affected areas morning and night two days prior to hair removal. After hair removal apply daily for maximum benefits. A “sharpened” hair pierces a neighbouring hair follicle resulting in a razor bump. But the powerful exfoliants in PFB Vanish “lift” the hair above the skin surface. Same ingredients as the original PFB Vanish but we added Dimethylmethoxy Chromanyl Palmitate to lighten dark spots. 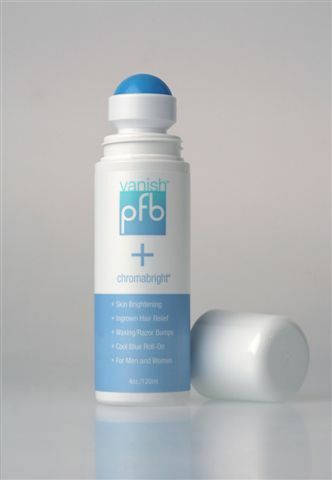 PFB Vanish with Chromabright© is a post-inflammatory hyperpigmentation product which was able to inhibit tyrosinase activity by 37%. PFB Vanish with Chromabright© was 45.9% more effective than Kojic acid and Hydroquinone. Only apply PFB+Chromabright once a day. This product should not be overused. Over use by Fitzpatrick skin types 4, 5 and 6 your skin is more sensitive and in some rare instances may darken. Discontinue use if this occurs.